A butcher block kitchen island can reduce your preparation and clean up time. The countertop surface is made of thick hardwood strips that have been glued together to create a knife-friendly surface. There are several choices and patterns available. The best work surface is created by using the end-grain side up because it's tough and is immune to gouges or cuts which can become a breeding ground for bacteria. The standard thickness of the finished block is four inches, although this can vary. There are many styles of butcher block islands, with some supporting a large work station in addition to the chopping block ease. Wood - Walnut and oak are popular choices but you're not limited to these. Decorative motifs and laminates - If cost is a concern, you can opt for laminate wood for any underneath cabinet doors and various treatments. Tile - If you wish to create a custom base, consider repeating the tile used in your kitchen countertops or backsplash. Brick - Building a brick base or brick laminate can give a warm homey feel to your butcher block island. Gathering Island - This style uses a slat shelf underneath the block a few inches off the floor. Depending on the length of the island, wicker baskets are installed on a drawer track so they can be pulled out from either side of the island, making it easy to use. 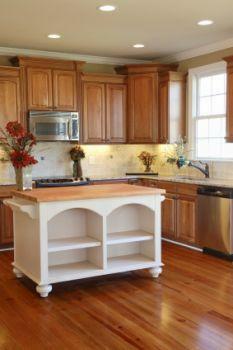 Racks, Drawers, Cabinets - This style of island offers great storage space. A towel rack is often added to one end of the island. Stainless Steel and Wheels - This is a very popular style of island, especially if you are a gourmet cook. The stainless steel mirrors the professional kitchen look. The wheels afford greater access and use by being able to roll your island wherever you wish to work. You can also change the look of your kitchen by removing the island to another room or area of your kitchen. More and more people are opting for roll-away kitchen accessories, appliances and even islands. Knife Rack and Hooks - This style can be combined with underneath cabinets and shelving. Breakfast Bar Extension - A nice feature for a butcher block island is a drop leaf that extends the use into a breakfast bar or serving area. Table Style - This choice gives the appearance of an old farm home or old world kitchen with large lathe turned legs similar to farm tables. You can stain or paint the base to match your kitchen or use a different color to give the island pop. While mineral oil is the best known oil finish, there are many blends on the market. Follow the manufacturer's directions for the best care practices of your investment. Your butcher block top arrives pre-treated with mineral oil. You'll want to clean off the excess oil with a paper towel before installing and using. You'll need to apply mineral oil to your butcher block top once a week for the first four weeks and then once a month to keep it resilient and looking good. You need to oil all of the exposed wood, not just the surface. For extra protection you can use a mixture of paraffin wax and mineral oil with a mixture ratio of 1 part mineral oil to 4 parts melted paraffin wax. This treatment gives additional protection of the wood against moisture and unwanted stains. Even if your wood is treated with a blended oil, the basic rules still apply. There are a few things you need to know before using your butcher block countertop. Don't use vinegar on or near the surface. Vinegar will crack and warp the wood. If you spill vinegar on your butcher block, the damage will be permanent. Don't clean with harsh chemical or detergents or abrasive cleaners. Don't install near a cooktop or dishwasher where there is excessive heat. Don't place hot pots and pans directly onto the wood surface. 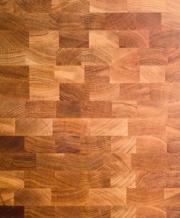 This can burn, discolor, warp, and crack you butcher block. Never use bleach or bleach based products. Many dish detergents have bleach, so read the labels carefully before applying any cleanser. Warm soapy water - Best way to clean the wood surface. Rinse with clean water. For mineral oil finish - Apply mineral oil only once a month after cleaning. Once thoroughly covered, let stand for approximately 30 minutes before wiping off excess with paper towel. Whatever style and design you choose for your butcher block kitchen island, you'll have many years of enjoyment if you take care of it.